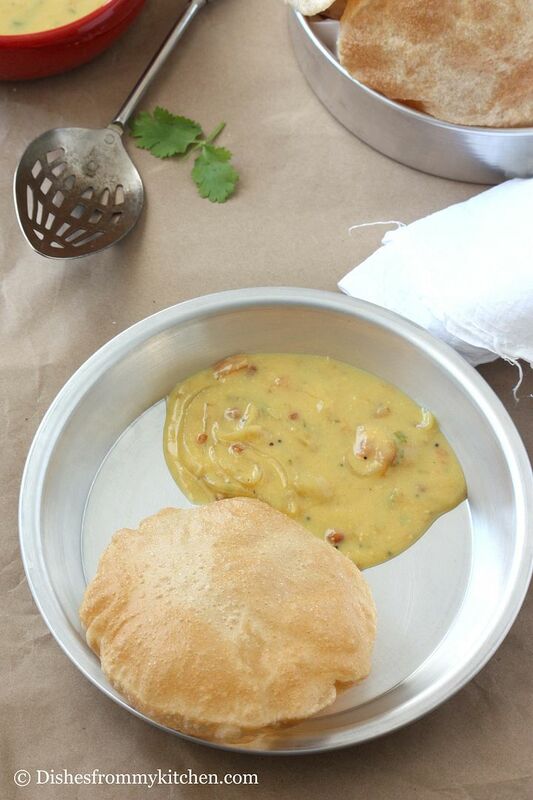 Dishesfrommykitchen: BOMBAY CHUTNEY - DELICIOUS COMBO WITH POORI !!! 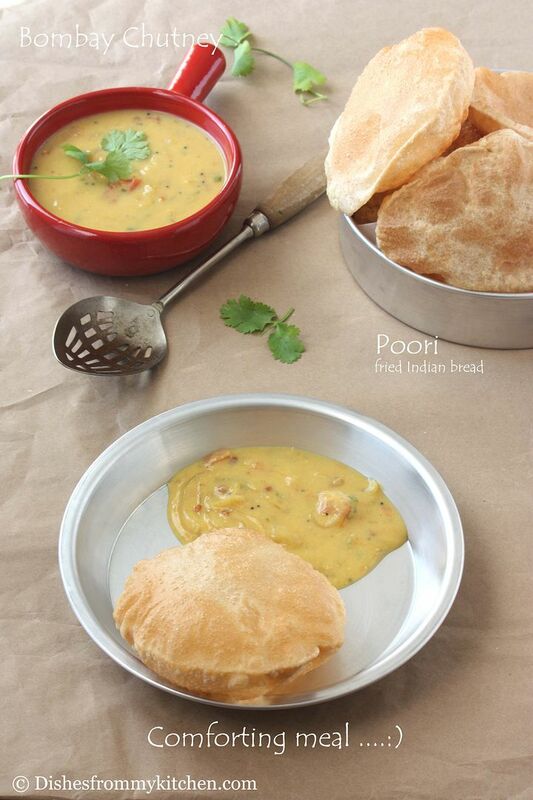 CLICK HERE FOR POORI RECIPE !!! 1. Heat oil in the pan; add mustard seeds, Urad dhal and Channa dhal. 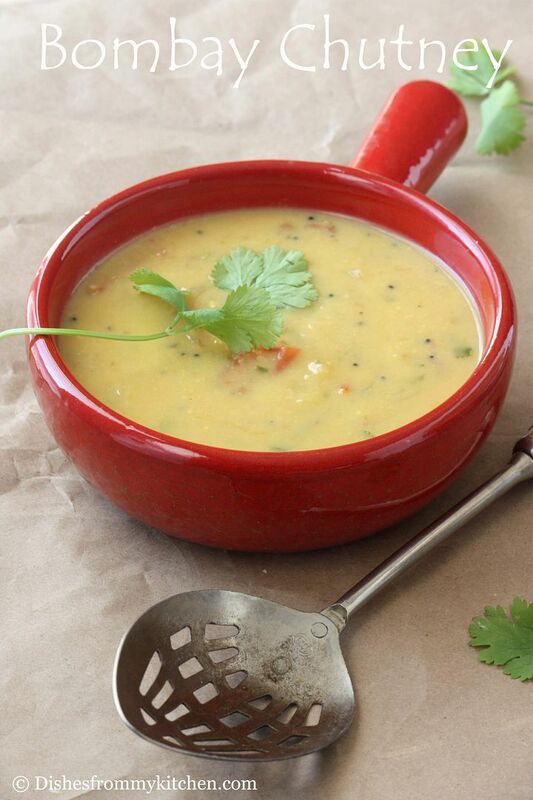 Once the mustard stop spluttering and dhal changes to golden brown color add onion and curry leaves. 2. When onion turns transparent add ginger and green chilli paste. 3. Now add tomato, turmeric and little salt. 4. Sauté till the tomato is mushy. 5. Now dilute the Besan with 2 cups of water using a whisk without any lumps. 6. 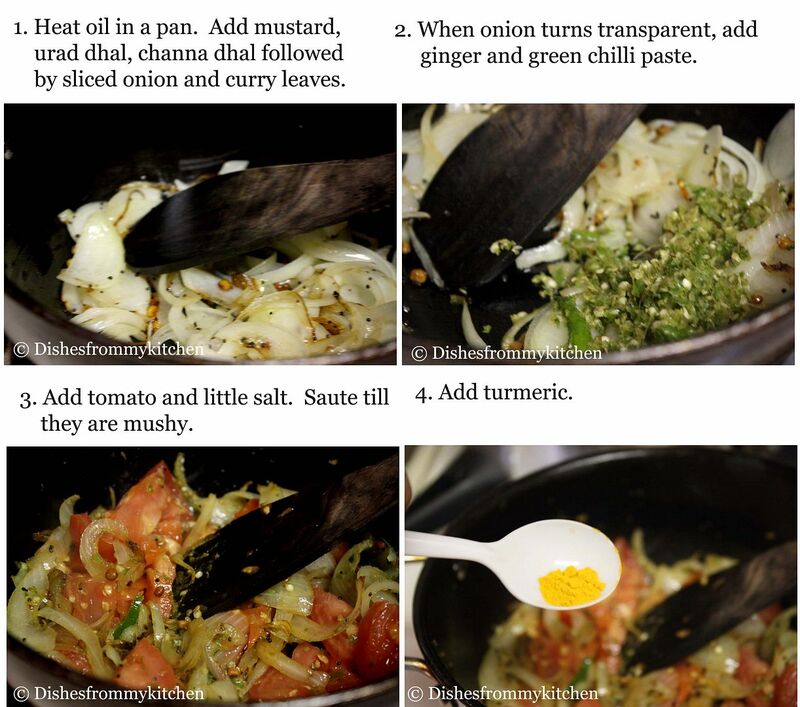 Add the diluted Besan to the tomato mixture and stir occasionally. 7. After few minutes the Besan mixtures comes to rolling boil, and it starts to thicken. You should not find any trace of raw smell from the Besan at this time. When the desired consistency is reached (when it cools it thickens so it should not be too thick when it is hot) switch of the flame. 8. Garnish with the chopped coriander leaves. This chutney sounds delicious I have never heard chutney made from besan. Very innovative , will definitely book mark and try it. Looks delicious! gorgeous clicks as always. I have never made this chutney. will definitely try it this weekend! I am having an auction fundraiser benefitting VSPCA India. Do drop by if you have a minute! my mom makes this very rarely. i totally forgot this chutney! 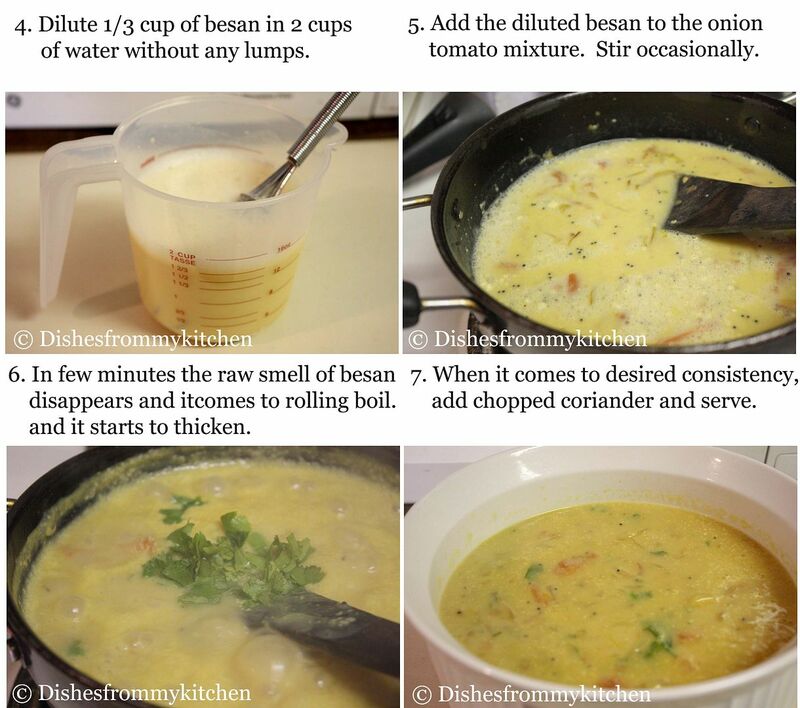 thanks for posting, sure i will try..
Prefect side dish for fluffy pooris.. Although I've eaten pooris many times in both India and Bahrain, but I don't remember having enjoyed this chutney. Most intriguing--looks great. Will try it very soon. Looks inviting. Nice step by step account. 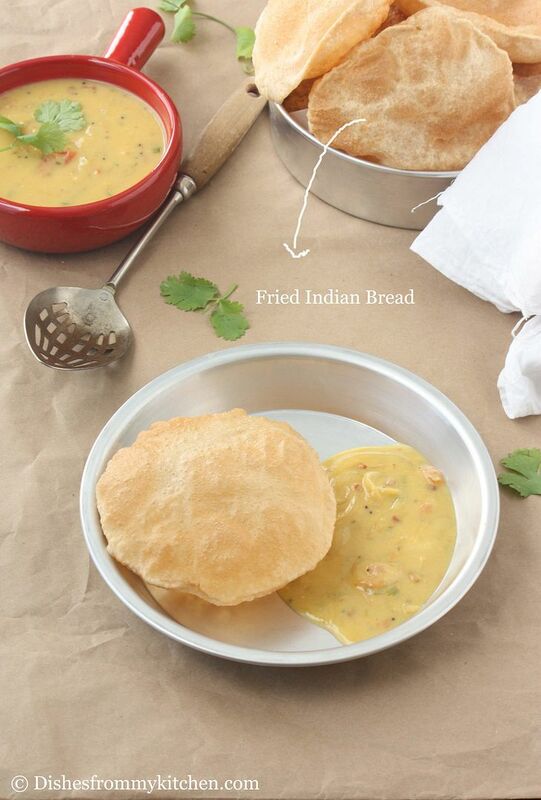 The name remains a mystery, but its the best thing with puris. I also add some boiled potatoes to it to please Manoj. This curry is new for me,will try sometime,looks yum,,. We make it without the tomatoes. We add lemon instead.